A work place should provide a healthy, collaborative environment where everyone works together towards a greater good. If you’re being disrespected, disregarded or generally abused at your work, you need to stand up for yourself. Not only for yourself, but for the next person who might be treated unjustly. Of course, that’s easier said than done. If you’re too bold you might stand yourself up out of a job. But if you remain timid, then you’ll just continue the destructive cycle and stay miserable, or quit. Tactfully standing up for yourself requires some foresight and a strategy. There’s a balance to everything, especially office politics. Don’t be cowardly, but certainly don’t rise to anger. Getting heated is only going to get met with more heat, and before you know it you’ll have a fire you can’t put out. 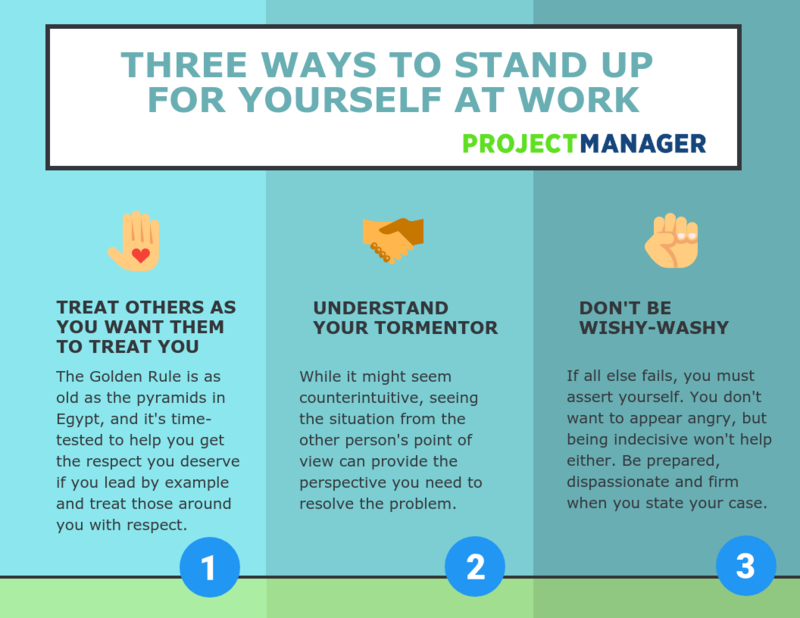 Instead of burning bridges, try these tactics to be professionally assertive, and finally stand up for yourself! Things happen at work. It’s high pressure, and different people deal with stress differently. It’s healthy to have some perspective. Maybe that person who seems to have you in their sights is going through some trouble at home, or perhaps they were just diagnosed with a bad illness. Or, perhaps, that illness from which they’re suffering is simply a bad attitude. It’s good to have compassion, but it’s bad to let yourself become a doormat. But what can you do if you’re unlucky enough to work in an inhumane environment? Yes, we’re going to quote the Golden Rule: “Do to others what you want them to do to you.” That quote is from the Christian Bible, taken from Jesus’ famous Sermon on the Mount. The earliest mention of this maxim dates to the Middle Kingdom in ancient Egypt, roughly between 2040 and 1650 BC. So, as a rule it’s been around long enough to have been thoroughly tested. The Golden Rule is all about leading by example, and it works surprisingly well. Do your work with a smile and treat others around you with kindness, and you might find that the person who has been giving you a hard time is now smiling back at you. You can also let your hard work do your talking for you. Rise above the office politics and focus all of your energy on doing your best work ever. It’s unlikely that anyone will publicly disrespect you and get away with it if you’re helping the team and making everyone around you look good. If leading by example isn’t working, then you have to be more outspoken with your instruction. Leadership author and Forbes contributor Margie Warrell writes that you have to teach people how to treat you. Your reactions when you’re addressed by a coworker, and whether they’re positive or negative, will teach them the best way to approach you. Of course this only works if your reactions are honest and represent your true emotions. This honesty is especially important when you encounter bullies. Bullies, she writes, prey on those who let them get away with their bad behavior. So, don’t remain silent when you should be speaking up for yourself. Stand up to a bully, and they’ll quickly aim their negative energy elsewhere. Okay, you tried the high road, but you’re still being treated like a lowlife. While it’s easy to play the victim, it’s not an identity you want to get attached to. Yes, you’re being victimized. Yes, you’re not being treated fairly. Yes, you deserve respect and you should be treated as a productive member of the team. But, and you knew a “but” was coming, if you can broaden your lens beyond your personal suffering and get a better perspective of the situation, you’ll be more able to shape it to your liking. Recently, NPR did a segment on dealing with a boss who is constantly hovering over you at work. How do you get this person to understand boundaries? For starters, try to understand that they are a person, and not just your tormentor. Maybe your boss is from a culture in which personal space is defined differently. That means your boss might not even be aware that their behavior is unusual, much less aggravating. The road to compassion is paved with empathy. If you dehumanize your tormentor things will get worse, but by attempting to understand the motivation behind their actions, you’re in a better position to address what’s bothering you. If leading by example and practicing compassion are not working, then you’re going to have to take more aggressive measures. That can be hard, especially when you’re dealing with someone who has authority over you. You don’t want to act arrogantly, but you don’t want to be wishy-washy either. To act wishy-washy is to appear like you’re weak or indecisive. It’s no way to get what you want or even be heard. Think about it. If someone started apologizing every other sentence when they’re talking to you about something important, you’d only hear those qualifying statements. It diminishes the main thrust of any argument. Your statement must have a clear point, and it must be made with confidence. It might sound polite to contemplate that the problem could be your fault, or that you are possibly ignorant of the bigger picture, but what that’s really doing is weakening your case. Qualifying statements will only provide a way for whomever you’re addressing to avoid the real issue at hand. You need to assert yourself, again, not in anger or sarcasm, but in a straight-forward and sincere manner. According to Psychology Today, it helps if you practice what you’re going to say before confronting the person you’re going to say it to. They suggest knowing what you want to change in their behavior, how their negative behavior affects you and what you feel is a desirable result. Once you’ve got that down, and you’re ready to assert yourself, be sure to stay firm, pleasant and look the person in the eye to let them know that you mean business. It’s hard to work in a toxic environment, and sometimes that toxicity is made worse because your team doesn’t have the best tools for the job. Project management software can improve your workflows, boost collaboration and ease tensions. Try ProjectManager.com today and make your work life a little bit easier with this free 30-day trial!